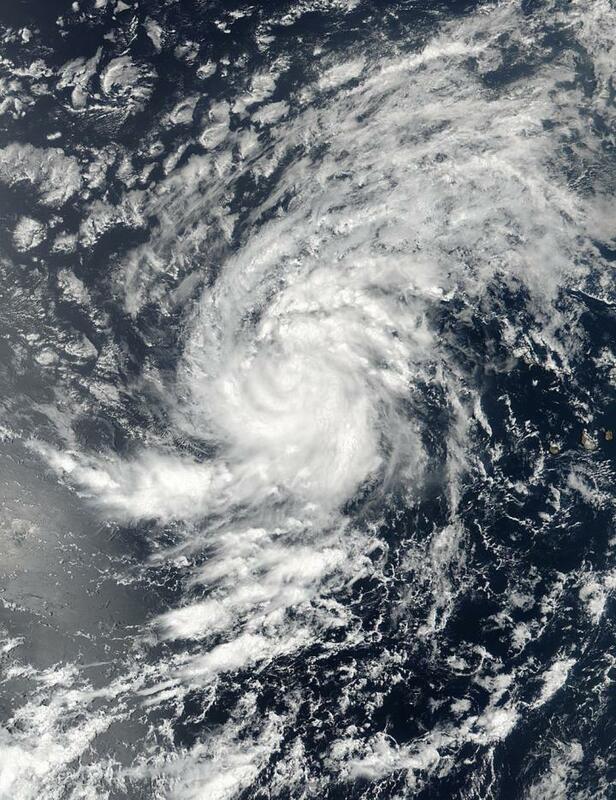 NASA-NOAA's Suomi NPP satellite passed over Tropical Storm Irma in the eastern Atlantic Ocean and captured a visible image of the storm on the move. Since Irma developed on Aug. 30 at 11 a.m. EDT it has been steadily strengthening. Just 24 hours later, the National Hurricane Center noted that the storm was approaching hurricane strength. On Aug. 30 at 11:36 a.m. EDT (1536 UTC) the Visible Infrared Imaging Radiometer Suite (VIIRS) instrument aboard Suomi NPP satellite captured a visible image of Irma that showed many curved bands of thunderstorms around the center. Bands of thunderstorms were wrapping into Irma's low level center from the west and south. At 5 a.m. EDT (0900 UTC) on Aug. 31 the center of Tropical Storm Irma was located near 16.5 degrees north latitude and 32.9 degrees west longitude. Irma is far from land areas. It's about 590 miles (950 km) west of the Cabo Verde Islands. Irma was moving toward the west near 12 mph (19 kph). The National Hurricane Center said that a west-northwestward motion is expected today and tonight, followed by a generally westward motion on Friday, Sept. 1. Maximum sustained winds have increased to near 70 mph (110 kph) with higher gusts. The estimated minimum central pressure is 997 millibars. Satellite imagery showed that Irma continued to become better organized with a developing central dense overcast and a few thunderstorm banding features. The storm appears fairly symmetric. Irma is moving over warm waters and an area where wind shear is expected to remain low, so the storm is expected to continue intensifying. NHC said Irma is likely to become a hurricane later in the day on Thursday, Aug. 31.